Delivering profitable sales & growth for our clients for over 78 years. 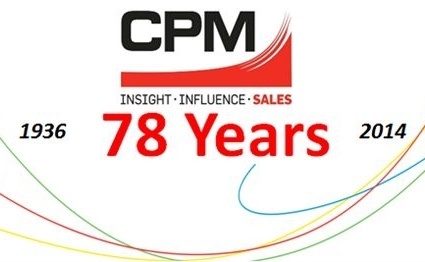 This year, CPM, award-winning international sales agency, completes its 78th year in business and with an increasing global footprint, we're faster, sharper, fresher and more high tech than ever before. We have produced a timeline highlighting our greatest moments and milestones from 1936 - 2014 ; from what began as a small UK sales business to what has since evolved to become a global leader in outsourced sales. Download CPM's 78 Year Story & Timeline.